A team of four Angus accountancy staff have raised over £1,000 for a rural charity following a gruelling challenge in the Highlands of Scotland. 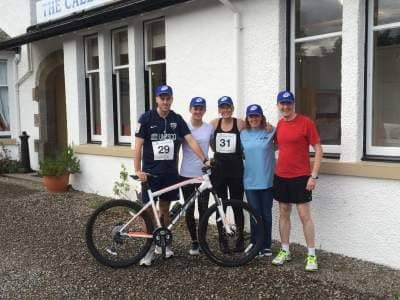 The quartet from EQ Accountants in Forfar took part in the RSABI Great Glen Challenge last month. With a route spanning from Fort Augustus to Fort William, the event raises money for RSABI, which throws a lifeline to those who have worked in land-based occupations but who have fallen on hard times. The charity is of great significance to the Forfar office, where many staff work with farms and other agricultural businesses. The EQ competitors were Mark McColgan, who embarked on a 17km run, Robert Urquhart, who took on a 46km mountain bike ride, Anna Coff, who walked 18km and Kiera McDonald, who made a splash in a 6km kayak race. Dating back to 1897, RSABI, provides financial assistance, support and advice in confidence to those who have worked in Scotland in land-based occupations and who are suffering hardship. Every year, RSABI helps hundreds of people with backgrounds in farming, crofting, forestry, horticulture, fish-farming, gamekeeping and rural estate work who, due to illness, disability, poverty or crisis, are unable to cope. RSABI relies on the generosity of its supporters – individuals, businesses and trusts – in order to ensure that they can continue to provide effective relief to those in need. There is still the chance to sponsor the EQ team – please visit http://uk.virginmoneygiving.com/team/EQAccountants or pop into any of the EQ offices (Cupar, Dundee Forfar or Glenrothes). For more information, visit www.eqaccountants.co.uk.